This map is brightly colored, showing city boundaries, all streets, schools, parks, etc. and done by a local map publisher - accuracy and detail are unmatched! 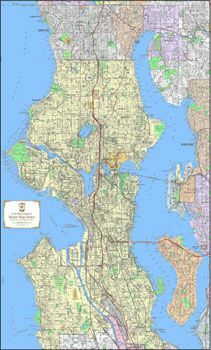 Available with zip codes or without, this map is from Kroll's independently maintained detailed street base, and maps can be customized for coverage area as well as for size. The standard size for this map is 3'x6', but we can adjust that to fit your needs. Item Number Size / Paper or Laminated / Zip Codes or No Zip Codes Price Qty.